ln October 1988 the locomotive arrived in Australia to take part in that country’sbicentenary celebrations as a central attraction in the Aus Steam ’88 festival. During the course of the next year it travelled more than 45,000 kilometres (28,000 mi) over Australian rails, concluding with a return transcontinental run from Sydney to Perth via Alice Springs. Other highlights included Flying Scotsman double-heading with NSWGRPacific locomotive 3801, a triple-parallel run alongside broad gauge Victorian Railways R class locomotives, parallel runs alongside South Australian Railways locomotives 520and 621, and a reunion with GWR 4073 Class Pendennis Castle in Perth. 8 August 1989 Flying Scotsman set another record en route to Alice Springs from Sydney, travelling 679 kilometres (422 mi) from Parkes to Broken Hill non-stop, the longest such run by a steam locomotive ever recorded. A plaque on the engine records the event. In January 2006, Flying Scotsman entered the Museum’s workshops for a major overhaul to return it to Gresley’s original specification and in order to renew its boiler certificate; originally planned to be completed by mid 2010 lthe late discovery of additional problems meant it would not be completed on time. The locomotive was moved in October 2013 to Buryfor work to return it to running condition in 2015.The bay in which the locomotive was being refurbished was on view to visitors to the NRM but the engine was rapidly dismantled to such an extent that the running plate was the only component recognisable to the casual observer. Early in 2009 it emerged that the overhaul would see the loco reunited with the last remaining genuine A3 boiler (acquired at the same time as the locomotive as a spare). The A4 boiler that the loco had used since the early 1980s was sold to Jeremy Hosking for potential use on his locomotive, LNER Class A4 4464 Bittern. In 2011the National Railway Museum (NRM) announced, that Flying Scotsman will be painted in LNER Wartime Black livery The letters ‘NE’ appear on the sides of the tender, along with the number ‘103’ on one side of the cab and ‘502’ on the other – the numbers it was given under the LNER’s renumbering system. Flying Scotsman will be repainted in its familiar-look Apple Green livery in the summer, but remained in black for the NRM’s Flying Scotsman Preview Weekend which took place on 28–30 May 2011. 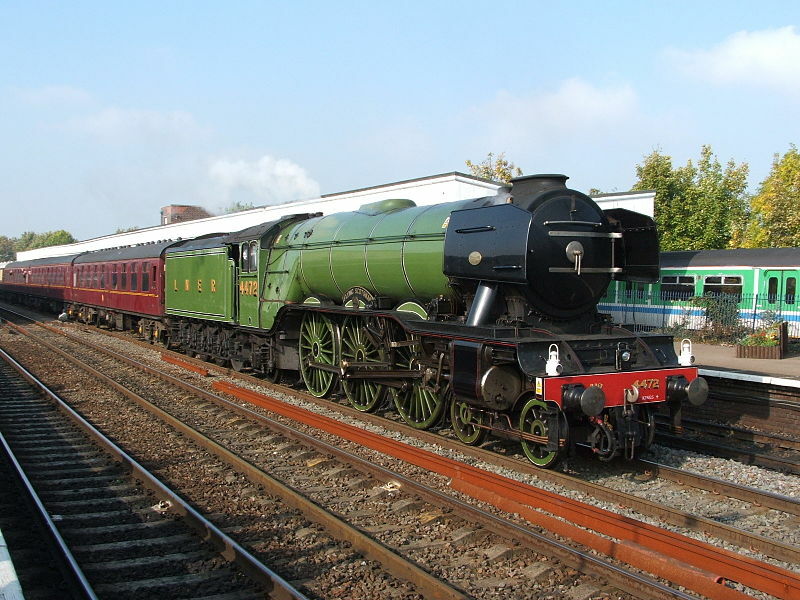 Furthermore, during the National Railway Museum’s ‘railfest’ event on 2–10 June 2012, Flying Scotsman was in attendance, being kept in front of Mallard in a siding, still in its Wartime Black livery.